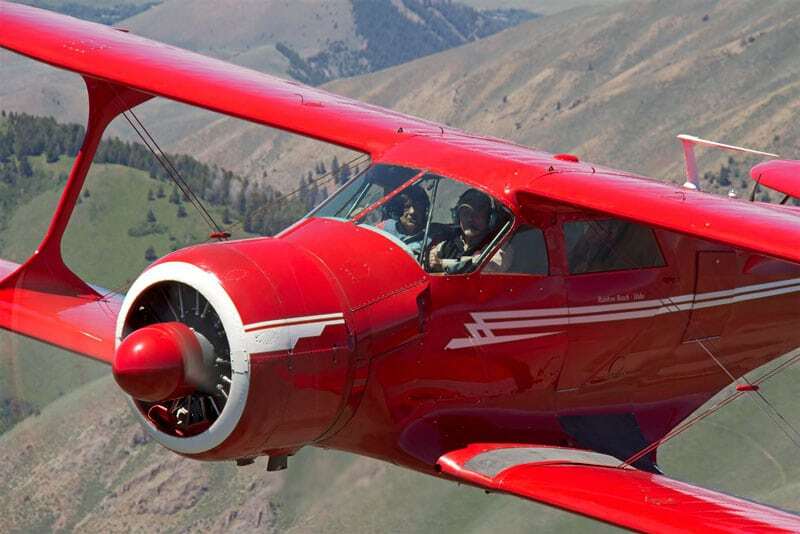 Take off and landing distance, speed, range, and useful load—many general aviation airplanes can match or exceed the Beech Staggerwing on any three of those parameters, but not all four. The Beech Staggerwing’s dark and powerful looking form seemed to intimidate the other aircraft, making an impression on this twelve-year-old boy. Little did I know that some twenty years later I would own that very airplane. Ask a group of general aviation pilots what their favorite airplane is and the most frequent answers will usually be the Beechcraft Model 17, or Staggerwing as it’s normally called, and the P-51 Mustang. The Mustang is a warbird of course and so projects raw power along with its beauty. But the Staggerwing is the epitome of elegant design married with jaw-dropping capabilities for an aircraft of any time; a plane that can carry a family across the continent in style and comfort. I love any airplane so long as it’s red, but Robert Hoff’s red Beech Staggerwing makes my knees weak every time I see it on the ramp at Idaho Falls (IDA). When he invited me for a ride in it a few years ago, I was transported into my personal aviation Heaven-on-Earth (or above Earth, to be precise). Swooping over the hills behind the Hoff family’s potato farm in that glorious red machine with its wide leather bench seats, round yokes, and vintage panel, we could have been zooming free above the American heartland back in 1939, before the terrible war that cost so many their lives, before the jet age, before cell phones and the Internet and the stress of modern city life. The Staggerwing is simply the world’s most beautiful time machine. Just seeing one, let alone sitting in it, is a great privilege. And it’s a privilege Bob Hoff never takes for granted. 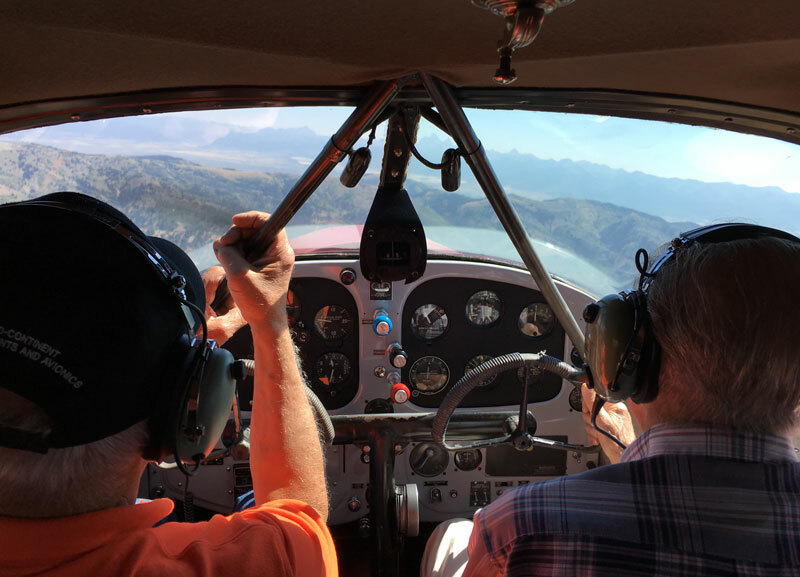 A leader in Idaho’s aviation community for over 50 years, Bob never misses a chance to promote general aviation, particularly in his home state. In 2006, in recognition of his efforts, Robert Hoff was inducted into the Idaho Aviation Hall of Fame. He is also a member of the Board of Trustees of the Beechcraft Heritage Museum in Tullahoma, Tennessee. 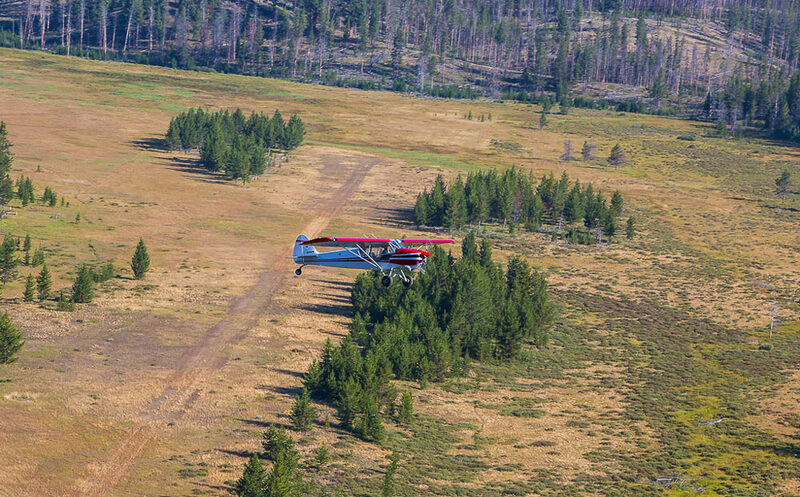 The Hoffs are a flying family: Bob normally flies his Staggerwing from the grass airstrip on their potato farm, just outside Idaho Falls. The farm has been in the family for over 100 years. In the 1940s, Bob’s parents purchased a Cessna 120 and both his mom and dad learned how to fly in it. Their CFI, “Jonesy,” later taught Bob, his brother, and Bob’s wife Jane how to fly, all in that same Cessna. Bob and Jane’s sons James and Thomas were also schooled in that C-120, and now granddaughter Savannah is a fourth-generation pilot. 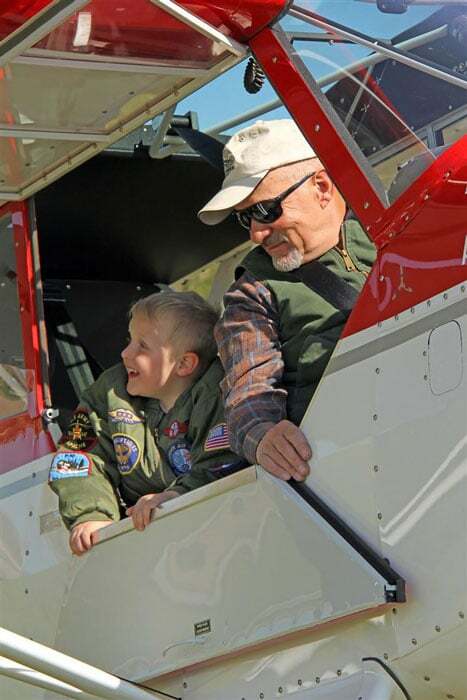 The two grandsons are still too young to fly but love to hop in with their parents or grandparents. Bob’s son James now runs the family farm and James’ brother Thomas runs the other family business, Aero Mark, the large general aviation FBO at the Idaho Falls airport. Its 30,000 square-foot XL hangar normally houses bizjets, but also hosts the Idaho Aviation Expo each year—another way the Hoff family gives back to the aviation community. In addition to the Staggerwing and the still-immaculately-polished Cessna 120, Bob and Jane own a polished Beech 18 or Twin Beech, a pair of Huskys, and a red Boeing Stearman, restored by Bob. 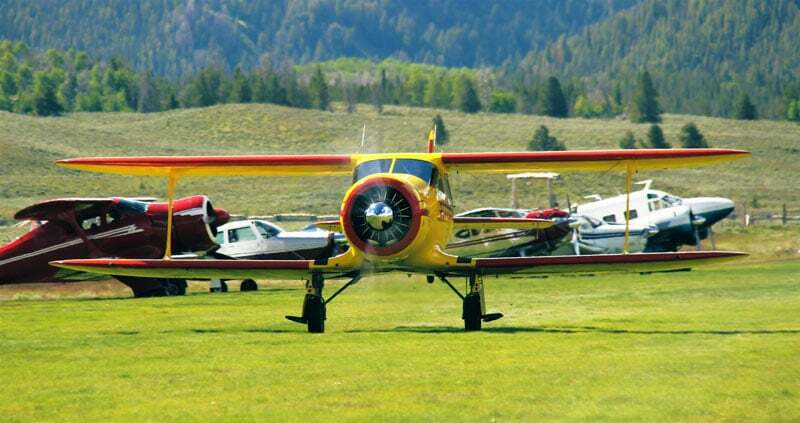 It matches another Stearman owned and restored by James, which you may have seen, with James flying it, in the nationally-televised Idaho potato ads. Bob frequently auctions off rides in his vintage airplanes, with the proceeds going to charity. Owners and fans of the Staggerwing may want to join the Staggerwing Club to receive its quarterly magazine. Click here to check out the club! 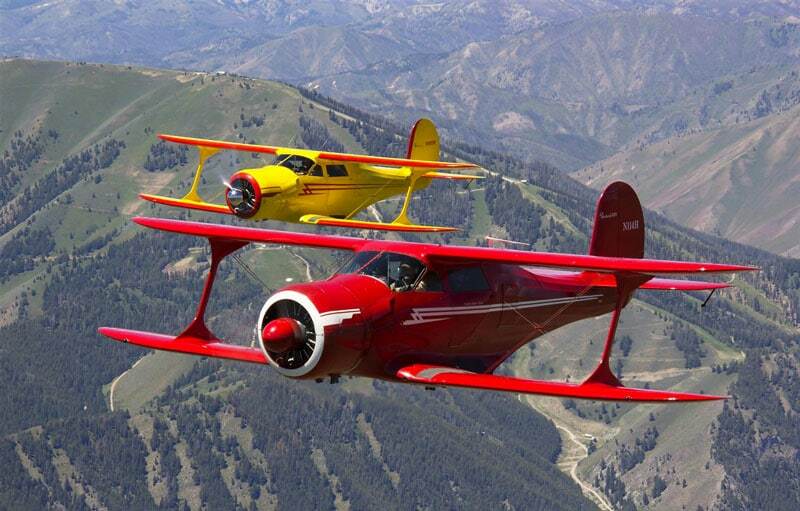 Here are Bob Hoff’s thoughts on the Beech Staggerwing. The day was windy, dark, and rainy, as I followed my dad to the lobby at the big log hanger at the Idaho Falls Airport (IDA). Looking across the ramp, I saw several Champs, Cubs, Cessnas, and Stinsons, all tugging at their tie downs. I remember stopping to gaze at one airplane I had never seen before. Its dark and powerful looking form seemed to intimidate the other aircraft, making an impression on this twelve-year-old boy. Little did I know that some twenty years later I would own that very airplane. Walter Beech was a part of Travel-Air when it closed its doors due to the Great Depression in 1931. Just one year earlier, Walter had married Olive Ann Mellor, a secretary at Travel-Air. 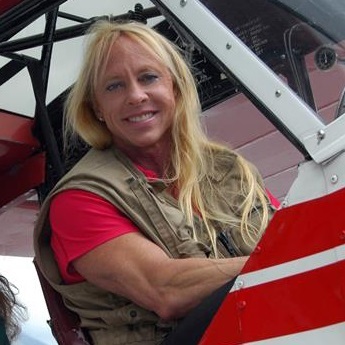 Investing all of their resources, they decided to hire Ted Wells, a Travel-Air engineer, and develop their own aircraft. In the spring of 1932, they started work in part of the old Travel-Air factory in Wichita, Kansas. Walter’s audacious goal was to come up with an airplane that would land at 60 mph and cruise at 200 mph. A little over six months later, on November 5th, 1932, Pete Hill flew the first “Beechcraft.” It was designated a model “17,” as the last Travel-Air was a “16.” This Beechcraft Model 17 was powered by a 420-hp Wright engine. I have a copy of Pete Hill’s log book showing that on the fourth flight he achieved 202 mph straight and level. The last entry of the test flight series was “practice landings.” The first Beechcraft airplanes had narrow gear in fairings and rather short fuselages with a hand-activated brake system. The rudder split, X-15 style, to enhance its effectiveness, but they were still known as a handful to land. Two of these were given 690-hp Wright engines and would do 250 mph. Neither exists now. In 1934 the “B” model came out with a fully retractable landing gear and a 225-hp Jacobs engine. These were followed by various horsepower Jacob-powered versions. The “C” model sported a lengthened fuselage. Some of these were powered by Jacobs engines and some by Wright engines. A Wright-powered “C” model was flown by Louise Thaden and Blanche Noyes to victory in the 1936 Bendix Race. I was able to meet and visit with Louise Thaden at Tullahoma, Tennessee in 1976. She seemed still ready to race. The D17S was introduced in 1937. Using the 450-hp Pratt & Whitney engine, the “D” proved to be the most-produced 17 series Beechcraft.1 Jacob-powered “E” models and “F” models followed, but the “D” model prevailed and was produced through 1945 with pretty much all of the production going to the war effort after late 1941. Another 18 “G” models were built after WWII. The “G” had a more streamlined cowling, a larger fin, and other refinements. But you could buy four new Bonanzas for the price of one “G” model, making it non-competitive financially and thus ending production. The name Staggerwing apparently came from race announcers, who shortened “negative stagger wing” to just Staggerwing. Walter Beech was not happy with this handle, as he wanted it called just ‘Beechcraft.” But it stuck and still is known primarily as a Staggerwing. Our Beechcraft Staggerwing (serial number 327) came off the production line in September 1939, painted “Barry’s Red.” (Barry, who worked for Beechcraft, developed the paints, so the colors were named for him.) Hue Draine of Corsicana, Texas had ordered the airplane with long-range fuel tanks, dual controls, two doors, an extra large oil reservoir, modified seat positions, and the latest avionics. Within two years, it was pressed into the war effort and given to the British RAF. Of the 24 taken, 22 were sent to Europe (sadly, 12 of those were sent to the bottom of the Atlantic when the ship carrying them was sunk by a German U-boat). Two of the confiscated Staggerwings stayed in the U.S. Ours was given a British designation as EB280 and used to carry Air Marshall Harris and other dignitaries on business in the U.S. After the war, the U.S. oilfield services company Halliburton put it in service with its new “N” number, N114H. After a couple more owners, N114H was purchased by Bill Woods of Boise, Idaho. Bill was known as the “old man of the mountains,” flying charter in Idaho’s backcountry. Where he took the two Staggerwings he owned amazes me, as they seemed to be “Cub” only type strips, such as Dewey Moore and Mile High (only about 500 feet long). Somehow N114H survived. A.D. Mallard traded a Cessna 206 to Bill Woods for N114H in 1969. I bought it in December 1971 after it had been turned over in a takeoff accident. Having an A & P license came in handy, as I spent all of my available time over the next four years rebuilding N114H. The Staggerwing was ready to fly again the spring of 1975 but I was not ready for it, with just a little Cessna 180 time. After about 10 hours dual from the former owner, I did solo it. Knees shaking—what a wonderful experience. I remember an early flight in it alone, just letting it climb with power up and accidentally going through 16,000 feet before realizing it does not need the oxygen as bad as I did. In the years since, N114H has taken us with speed and comfort over most of our country. It has never left us stuck overnight for a mechanical, although we did fly 2,000 miles without a working generator once. The Staggerwing is, however, an electric airplane with both gear and flaps electrically driven. It is a somewhat complex airplane for its era and does need maintenance with mechanics familiar with its systems. A sound Staggerwing is not difficult to annual. I have a sort of progressive upkeep program, so all major components are overhauled every 10–15 years. That way it is not down for over a few months at a time. As of right now, N114H is pretty fresh but is getting a new cowling this spring. Being an airplane salesman for 21 years with Aviat Husky, I have often wished I could have been a Staggerwing salesman for Walter Beech. I would have loved to have demoed the airplane. Compared to anything else of its era, the Staggerwing must have been amazing. And even now, can you find a comparable performer considering the whole flight envelope? Take off and landing distance, speed, range, and useful load—many general aviation airplanes can match or exceed any three of those parameters, but not all four. A handful of Staggerwing enthusiasts started an annual get-together at Tullahoma, Tennessee in the late 1960s. 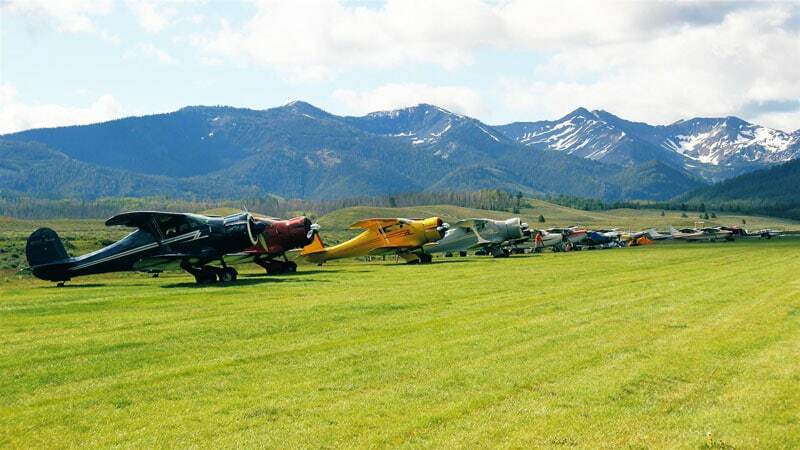 The first time we attended, in 1976, we found over 40 Staggerwings parked together on the green grass of a Tennessee June. This event was hosted by John and Charlotte Parish and family along with the many good people of Tullahoma. Eventually, a museum was built and expanded to preserve Beech history from the Staggerwing to the Starship and beyond. Unfortunately, we are lucky to get a dozen or so Staggerwings attending now. Although there are over 150 registered, we estimate only about 50 are actively flying. Many are in museums or are under restoration. Value depends on model and condition. Restoration costs far exceed the finished value, but it is a lot of performance for the typical investment. If you do taxi up with your own Staggerwing, I think you do have the right to “swagger” just a little. Flying one requires your attention but to me, that is what it is all about. Take off and landing can be a bit dicey but once in the air, there is no comparison. The wing configuration makes full stalls just a shudder, and neutral dihedral gives it wonderful roll response. You might guess the Staggerwing is my favorite airplane and I can’t imagine not having one to fly. Bob Hoff flying over Galena Summit, Idaho. Photo by Thomas Hoff. I did 32 years at Beech. QA cert for Starship, Premier and 4000. Never got to fly in a Staggerwing. Is there a chance I could some time before i die??? My son is an airline pilot so getting any where is not an issue.